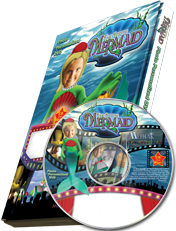 This Photo-Personalized DVD features your child as the curious "Little Mermaid" Wander the deep blue sea, interact with friendly sea creatures and make the ultimate deal for a chance at love in a finless form. This classic tale provides waves of underwater adventure. 9 captivating scenes with the Little Mermaid and sea friends personalized to encourage imaginative thinking, a strong curiosity and a sea of fun. The child's picture is used 47 times. Length of DVD is approx. 22 minutes.